This cake was created using the Wilton ball tin. The first thing I did was I sandwiched the halves of the cake together using buttercream icing. I also used a thin even layer of buttercream icing around the outside of the ball. I let the buttercream set in the refridgerator first for about 20 minutes and then I covered it in red fondant and rubbed it gently with my hands until it was smooth all over. I then cut out the patterns that you see in the picture above from thinly rolled yellow fondant and placed them on the bakugan ball. 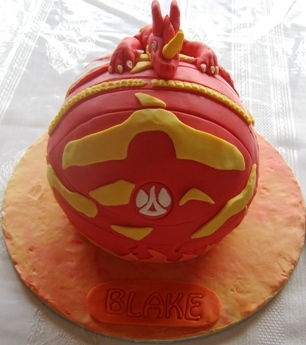 Using red and yellow fondant, I sculpted the red dragon, Drago that you see on top of the bakugan ball. Finally, the board was covered in red, yellow and orange fondant combined. I did this in sticking with the theme of this cake because the the pyro Dragon represents fire/heat. It is like a work of art. Wow, my boys are Bakugan crazy and Drago certainly is a favourite. This is so well done.